Rose-Hulman once again leads U.S. News & World Report’s Best Colleges rankings as America’s top engineering school that’s focused on bachelor’s- and master’s-level education. This marks the 20th consecutive year that the institute has ranked No. 1. TERRE HAUTE, Ind. – Rose-Hulman Institute of Technology once again leads U.S. News & World Report’s Best Colleges rankings as America’s top engineering school that’s focused on bachelor’s- and master’s-level education. This marks the 20th consecutive year that Rose-Hulman has ranked No. 1 among accredited undergraduate engineering programs in a survey of U.S. college engineering deans and senior faculty. Survey participants were asked to rate programs with which they were familiar on a scale of 1 (marginal) to 5 (distinguished). Rose-Hulman earned a 4.6 score. The institute also earned top survey marks in four academic department categories: civil engineering, computer engineering, electrical engineering and mechanical engineering. 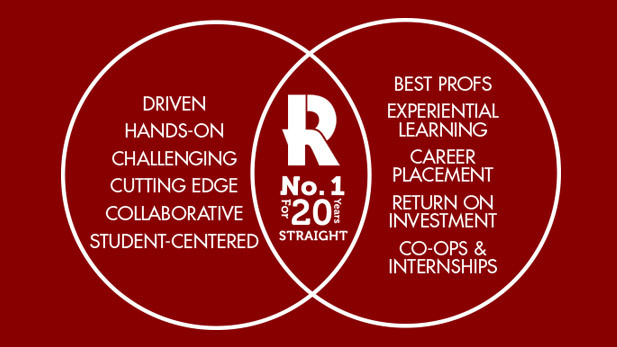 The U.S. News distinction follows rankings by Forbes, PayScale, Niche and other organizations recognizing Rose-Hulman’s high return on investment, faculty expertise, career placement, and alumni success—to name a few. Learn more about Rose-Hulman’s rankings and distinctions. Rose-Hulman faculty lead national conversations about laboratory teaching and change in engineering education at conferences each school year, Conwell noted. Several faculty have been recognized as outstanding teachers and scholars by national organizations. Provost and Vice President for Academic Affairs Anne Houtman notes that two facilities on the Rose-Hulman campus—one to open early this winter—will provide additional teaching flexibility and expand student project space, supporting best practices and new initiatives in science, engineering and mathematics instruction. Those initiatives include the nation’s first undergraduate degree program in engineering design that was added to Rose-Hulman’s curriculum this fall.